I had a few apples left from my trip to the orchard. They needed to be used up, but I wanted to try something new. I also had some bread, that wasn’t the freshest, that needed to be used up. I looked for a recipe for apple bread pudding, but I could not find one I liked. So, I came up with my own version. Bread pudding is one of those frugal old fashioned desserts. I like regular bread pudding, but I usually like to give it a unique twist. I like to make it a little different. This recipe is your basic bread pudding, but I tweaked it by adding apples. This turned out really well. My kids loved it. I loved it because I used up some ingredients that I needed to. I also love the fact that I created a semi healthy (it does contain apples after all),dessert. Mix together apples and bread. In separate large bowl whisk together milk, eggs, sugar, vanilla, and cinnamon, then add bread and apples. Mix together well. Pour into an 11×7 or about that pan. Place that an into a 9×13 pan and fill the outer pan (9×13 pan) with about 1 inch of water. Your size of pan does not matter so much, as long as the pan with the bread mixture can fit into a pan with water into it. You are creating a water bath, which is important in giving this bread pudding its texture. Bake at 350 for 55-60 minutes. 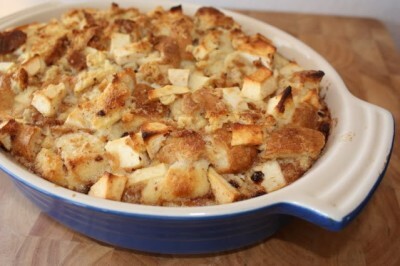 I’ve never had bread pudding, but this with the apples sounds delicious =D. Sounds delicious and easy! Thanks for sharing. Have a great day!! This looks delicious! Is there a specific type of bread that work better? @Maria Messa, I use whatever I have for bread pudding. Store bought, french bread, homemade, etc. I think it all works. But if you use homemade bread cut the cubes a little smaller since it is usually a more dense bread. You could probably serve this for breakfast, too. I am definitely going to save this recipe, especially for company. Thanks so much and I LOVE your site! .-= Lisa´s last blog ..The Coming of Titus =-. This looks beautiful! We have left-over apple challah from Rosh Hashana, which I froze, and plan to make into a bread pudding. I may add in some apples to mimic your recipe! Fantastic idea! It’s lovely to see a healthier bread pudding and your version looks absolutely delicious.